A folly is a structure, usually an expensive one, with no obvious purpose. It is often vaguely decorative, perhaps symbolic, maybe disguising something else, but rarely particularly useful. According to the Folly Fellowship – a society dedicated to the study of, well, follies – there are at least 1100 follies in the United Kingdom. The heyday for folly-building appears to have been in the 18th century. Racton Folly was designed by Theodosius Keene (or Kelne? ), commissioned by the 2nd Earl of Halifax and built between 1766 and 1775. The 2nd Earl of Halifax (1716-71) was a statesman who inherited nearby Stansted Park and who gloried in the name George Montagu-Dunk. He has an elaborate memorial in Westminster Abbey which says he “contributed so largely to the commerce and splendour of America as to be styled ‘Father of the Colonies’ ”. Halifax, Nova Scotia, is actually named after him. It has been suggested that the folly enabled Halifax to see his ships dock at Emsworth harbour about 3 miles away. In fact, no one knows why he ever built the thing; it may have been just a rich man’s whimsical fancy, perhaps some kind of summerhouse; and, as you can see from the dates, he may not have lived to enjoy it anyway. 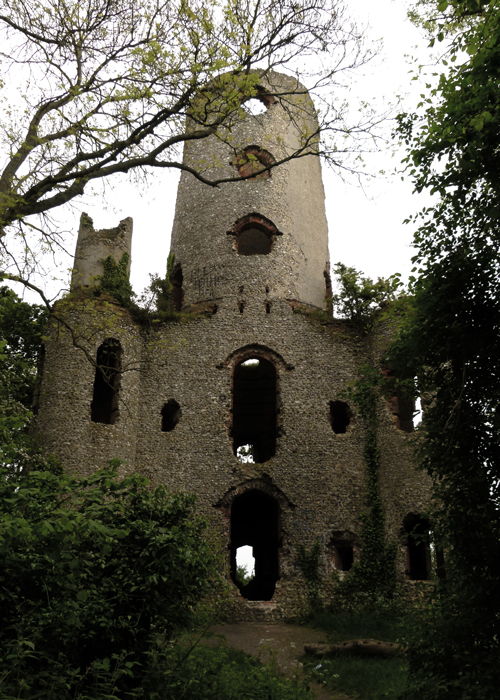 Whatever its intended purpose, Racton Folly seems to have been a complete waste of time and money – a genuine folly, in fact. It’s certainly elaborate. Constructed of brick and flint, it has a triangular base with a small round turret at each vertex and a tall, tapering, central tower of four stories – about 80 feet high. Today, it’s a Grade II listed ruined curiosity. It could be a romantic building, ivy-clad, straight out of a Gothic fairy-tale. But, oh, it’s a cold, unpleasant, place. The floors and roof have long gone, it is littered with rubbish, covered in graffiti and has a distinctly nasty ambience. Sometimes it’s known as Racton Monument (to what? 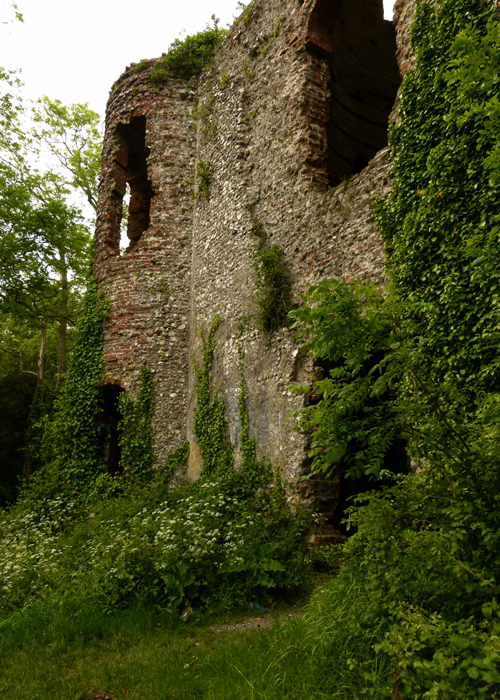 ), Racton Tower, or even Stansted Castle. No one’s alive to tell us what happened there, before or after it fell into disrepair. Sadly, it has been the location for at least one suicide. There was talk, they say, of turning it into a dwelling, but nothing came of it. There are rumours of smugglers. It is a relatively isolated spot – an ideal place for folk to do things they shouldn’t, away from prying eyes. Inevitably, it attracts stories; you know the sort of thing. I have read that evidence of witchcraft has been found there – surprisingly recently. Paranormal groups have investigated reports of bricks being thrown out of upper windows; the ghostly figure of a woman walking through the ruins; a disembodied face at a window; even a phantom tractor. One group of investigators experienced eerie whisperings in their ears, and the sensation of being touched. Sceptics say the reports have been fuelled by overactive imaginations, adolescent pranksters, alcohol, or drugs. So what do you think? This is no obvious tourist attraction. The dense foliage shuts out the modern world. Overhead, cawing rooks wheel in the sky and dying leaves rustle in the breeze. Did you imagine someone walking outside, behind you; hear shuffling behind the wall? Was that a murmured sigh coming from that room, or rats scavenging in the mess on the floor? The air of desolation and decay is uncomfortable. Really, there is nothing to worry about; it’s just an old, slightly weird, ruin. But people will be back, searching for something, you know they will. Some may even go on the eve of All Hallows, when spirits ride through the sky laughing, the souls of the dead are abroad and sensible folk stay at home and bolt their doors. You’ll find Racton Folly by walking up a bridleway on a small hill, just to the south of Walderton, on the B2146. Don’t forget your garlic, holy water etc. By the way, it is worth mentioning that there is a Racton Man, found on farmland nearby. He is an almost complete skeleton of a Bronze Age warrior who died sometime between 2150 and 2300BC; but there’s no need for concern – he’s safely in Chichester’s Novium Museum now. Neat place! You photographed it expertly and artistically. Thanks Linda – and thanks for dropping in. Yes, it does look a spooky place! As I was reading, I wondered about how our Dunk Island got its name and, voilà, here’s the story: https://en.m.wikipedia.org/wiki/Dunk_Island (the History section). Small world, eh! Who’d have thought?! Personally, I think they should have stuck with The Island of Peace and Plenty. So still a folly. ‘Restoration Man’ needs to have a go. What a strange, sad place! Yes, it’s a little forlorn isn’t it? Obviously, no one wanted to look after it – too far from any house or garden, probably. Thanks for dropping in and leaving a comment! So many interesting places to visit. A little creepy to say the least. Yes, I wouldn’t go out of my way to see this one if I were you. Thank you for visiting and leaving a comment! Sad that it is full of rubbish. Why can people not leave a place the way they found it, i.e. take their empty cans and crisp bags away with them? They were able to carry them alright when they were full, so what’s the problem with an empty one? 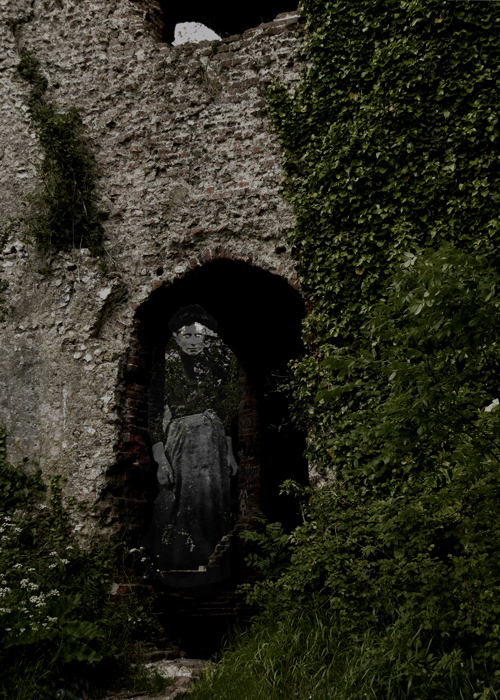 The “no floors or roof” image of Racton folly form a perfect face for Halloween and the character of the place in general certainly fits that mood. You’d better stand guard. I went back for a closer look! Another great post Mike, thanks. I love places like that with a hint of mystery. Lucinda Lambton had a series years ago on improbable curiosities and each episode was a real delight and a genuine voyage into the unknown. Wish they would screen it again.. I wonder if other countries have any follies or was it just the mad English Victorian gentlemen that conceived the idea of a useless building. No, I think people have been mad in other places too. 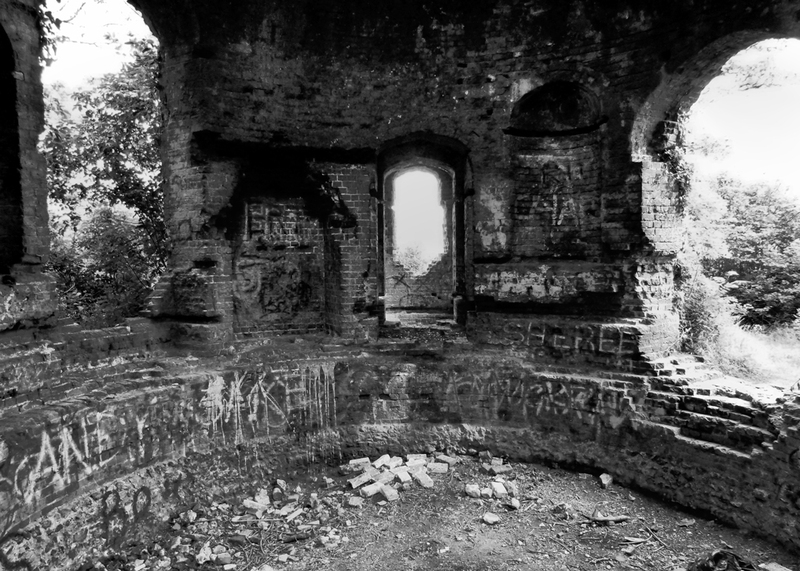 It certainly does look like the sort of place that would inspire ghostly stories! From what I can see on your photos, although it’s been faced with stone on the outside, there’s been little attempt to beautify the inside. This suggests to me that it was built merely to enhance the view from the main house at Stansted Park. This was often done to give the impression that the landowner’s family had held the land for centuries when in fact most of them were recent arrivals. It was also a fashionable thing to have a ruin in the grounds, a finishing touch for the landscape gardener. Sure. Though in this case I’m not sure the folly could be seen from the house. Very cool. Very creepy. Looks like a place to go only in broad daylight. I love the idea of a phantom tractor. 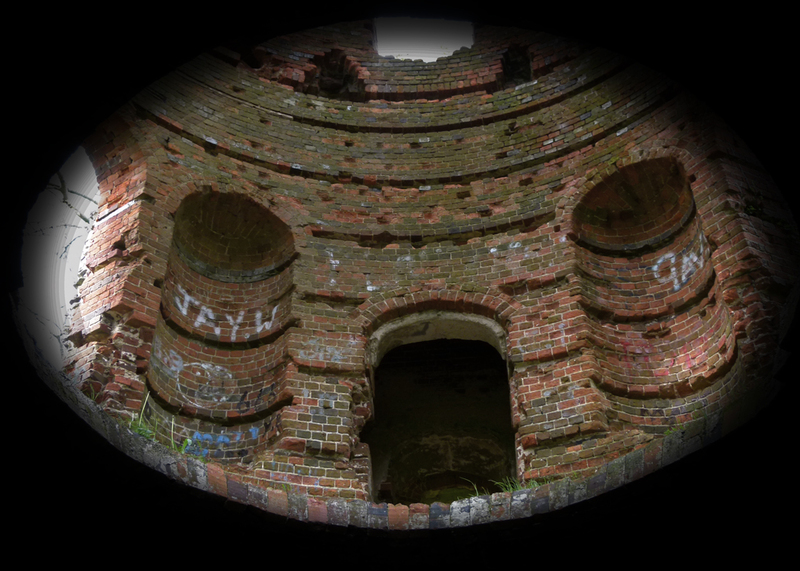 It does look a lot grimmer than most follies I’ve seen. Do you know if it’s just a British form of eccentricity or are the follies abroad as well? No, I think follies can be found anywhere there are people with more money than they know what to do with, though we do seem to have rather a lot!